Egg-cellent news! 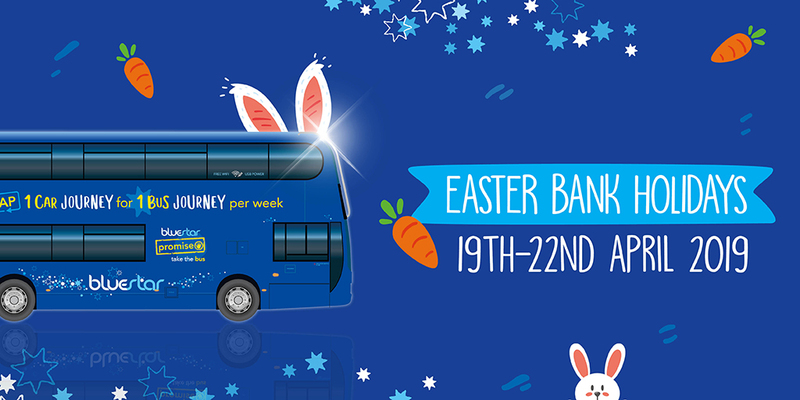 With lots to do and see in Southampton and South Hampshire this Easter, don’t hop like a rabbit, hop on a bus and have a great day out with all the family. The Easter weekend is fast approaching, and there’s more reason than ever to get out and about this year with the increased service on board bluestar. We will be running a Saturday timetable (on most routes) on Good Friday. We will also be running a frequent service on Easter Saturday, Easter Sunday and Easter Monday so you can still get around with ease. Don’t forget we have great value tickets for all the family too, including on the clickit2ride mobile app, perfect if you have a busy Easter weekend ahead! A Sunday service running on Bluestar 6. We will be operating a normal Saturday service on all routes. We will be operating a normal Sunday/Public Holiday service on all routes. Use Unilink services? See how they will be running over the Easter period.